I'm still trying to work the kinks out of my FB page. I tonight I'm going to try linking my blog with the page. What I've written here is Part II of "how my bear making began. My mother taught me to sew the summer before the 8th grade. She set her Kenmore sewing machine that weighed a kazillion pounds on the dining room table. Until this week when Sweetie helped me move every scrap of cloth, pin cushion, ruler and rotary cutter I own into my very own space, dining rooms and sewing rooms have been interchangeable. There’s good light, a big table for cutting pattern pieces, and only used as a dining room on holidays. That left a lot of empty table and time, so why not use it to create? And create I did. I made most of wardrobe for years. I came within one “Say Yes to the Dress” shopping day of making my own wedding dress. I sewed for my children and grandchildren. Then I tried my hand at quilting. I stitched my first quilt by hand from start to finish. It didn’t take me long to figure out piecing intricate patterns would be faster and easier on the sewing machine - $600 dollar Elna (the most expensive thing I ever bought for myself) that I bought in 1981 and still use. Talk about takes a licking and goes on ticking. When I moved back home to care for my parents, I sat at the same end of the same dining table where I first put foot to pedal. By this time my mom had had a stroke and given up doing any needlework. Instead she stood, quiet as a little mouse, behind me and watched. If I did something wrong, she noticed it before I did. When I laid the quilt tops on the living room carpet both Mom and Dad felt free to critique my color selections and block placements. I once looked up from sitting in the middle of a quilt, to find my mom silently shaking her head - no, that doesn't work. I was an adult when my mom’s illness took away her ability to have the woman to woman mom/daughter conversations I craved. She could, however, get her point across without a lot of words - sometimes all she had to do was give you the evil eye. In a strange way, the time I spent sewing with her looking on, was conversation enough. My mother made afghans, not quilts. Yet somewhere in her New England gene pool, she developed a healthy respect for hand-me-downs, and repurposing. Recycling clothes and fabric is not new. In Colonial times, most women didn’t have time to make the pieced quilts we see in books and museums. These were made by wealthier women, who didn’t spend their days in survival mode. Instead quilts were made to show off needlework skills. By the mid 1800’s quilters used bits of clothing fabric to make pieced blocks. Often prized for their beauty, quilts also had a utilitarian mission. I feel sure when pioneers headed west, and had to leave somethings behind, the handmade quilts were never considered. After my mom died, I thought it would be cathartic to make quilts for my dad and sisters from her clothing - like a new life from old clothes resurrection metaphor. But after cutting her blouses, pants, and nightgowns into squares, I got stuck. I didn’t want to hold blue flannel squares that reminded me of tucking mom into bed. I wanted her there by me in her flannel nightgown and velour robe. I put my sewing machine away and didn't think about sewing for three years. 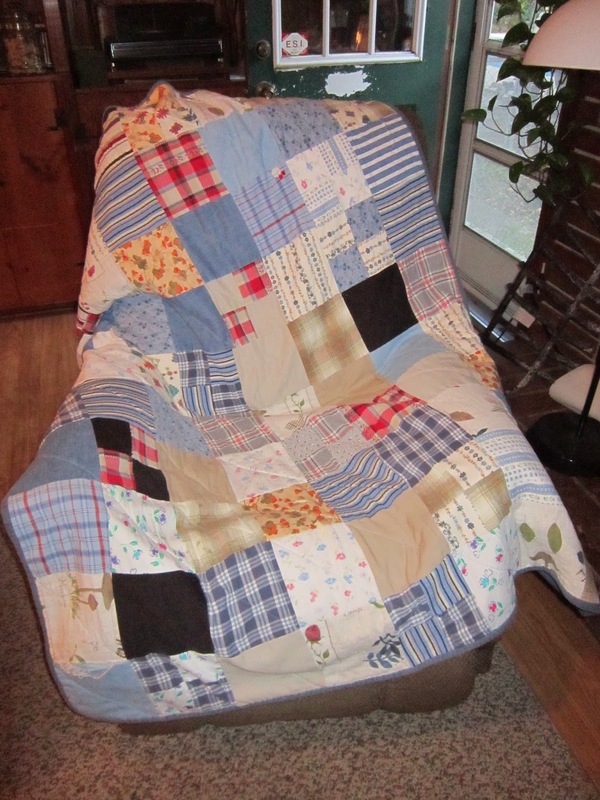 When I finally finished the quilt(s) my father used his to cover his legs during afternoon naps. That’s when I first noticed that it wasn't just the quilt, or piece of cloth art that covered him. As he slept I sensed the longtime love that somehow lived on in that fabric. I spent yesterday doing two things - constructing a new Facebook page and cleaning out a file cabinet. Both were tedious jobs, with a lot of deleting involved. In one file folder I found receipts from the ship store in Guam. My mother's Noritake 96 piece china service cost all of $40.00. As for computer files, they just disappeared at will. So I'm going to try again to tell you about my Facebook page. Back in December I wrote about making memory bears. I wanted a place to post pictures and stories of the bears and people they represent. And yes, I will use it as a way to do some marketing. I'm not so good at asking people to buy things, so I use marketing in the very broadest sense of the word. My writing bud Amy convinced me Facebook was the way to go. She was as confused as me after an hour's phone conversation. The page is a work in progress, but I'd love it if you'd check it out. If you want to feel free to like, share, comment. I can use all the help I can get in spreading the word.